Since the city of Bandung is held by a Ridwan Kamil who is a graduated from a leading university ITB majoring in architectural engineering, as the city nicknamed Paris Van Java is not stop innovating and continue to beautify the look of the city to restore the title of his city is very popular since the Dutch colonial era. And one of the smart ideas and need to get the appreciation is to change the face of Bandung's square that some years earlier was synonymous with the word "neglected" because it is left as a makeshift garden that is not clear allotment function and "not orderly" with the number of street vendors are free Stalls and selling at will, and "closed" because the visitor was not free to go into the square because the iron fence is surrounded by a high enough fence, making it difficult for residents of bandung and tourists who are traveling around Bandung Square is to enter Page area From this great mosque of Bandung. Now, the face of Bandung Square now has changed the negative stigma attached to one tourist attraction in this famous city of Bandung for tens of years ago. If earlier in the middle of the plaza area in the city of Bandung it looks narrow Because the arrangement of the park that is not considered such as the placement of large pots that contain plants with very large flowers. Now after all the large pots are removed and changed into an area resembling a ball field with green grass synthetic material area of ​​1200 m2 it, then Now also the middle area of ​​the city square of Bandung also looks more spacious and can be functioned to place refreshing, play until lesehan thousands of people who have visited it. 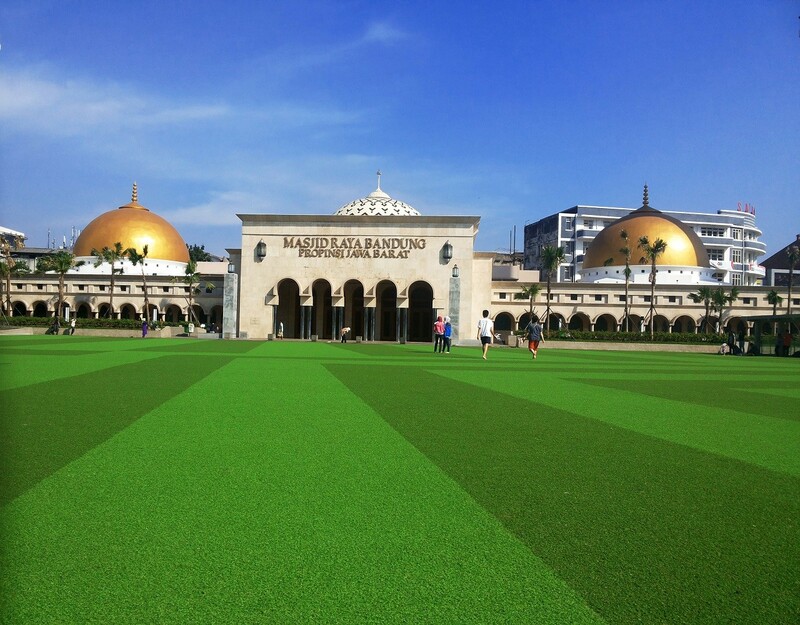 You can also climb to the tower of the great mosque by paying only Rp. 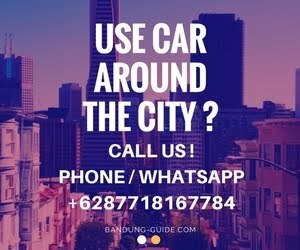 4.000,00 to be able to see the city of bandung. 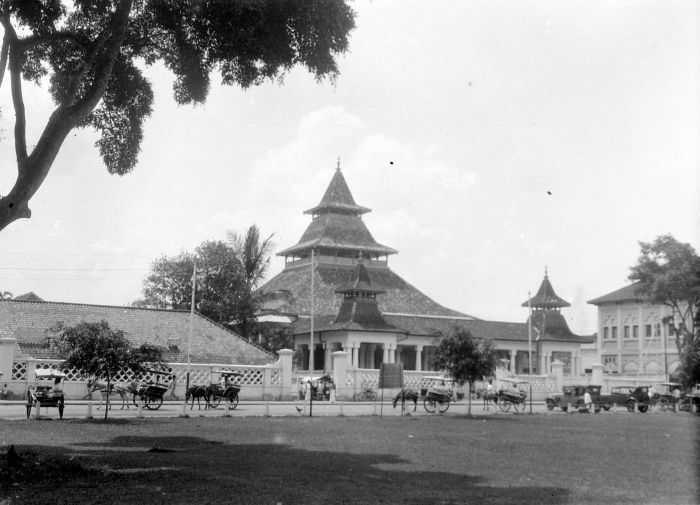 The first time the establishment of Bandung, the horse is a very important means of transportation used to deliver the letter. Usually, within a certain distance there must be a replacement horse to replace the first horse. Usually on the post. One of the surrogate posts on the postal highway (Grote Postweg) is near the Post Office building of Bandung which is now next to the postal highway (Grote Postweg) and Jalan Banceuy. Banceuy Street was originally derived from the name Oude Kerkhoffweg because there has been a place of Chinese graves. It's now a center for the sale of auto and electric parts. Bandung Square which is in the south of Grote Postweg can be called is still there, can also be called no. 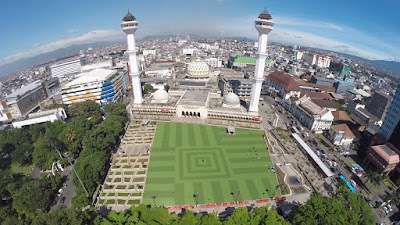 Called none because physically has been used as plaza Masjid Raya Bandung-West Java Province. The opposite is said to exist, because the people of Bandung still call this place the square. The location of the city square of Bandung is very strategic indeed make it as one of the locations in the city of Bandung is always crowded with various activities 24 hours.In addition to its location is in the center of the city of Bandung, Bandung Square is also surrounded by Bandung community business centers such as the center Shopping municipal Bandung such as malls, centers and the center of culinary tourism center in the city of Bandung and of course be an integral part of the Great Mosque Great Bandung.